AAI Corporation Builds Competitiveness with HPC and the “Black Art” of Computational Fluid Dynamics is a case study published by the Council on Competitiveness for the express purpose of demonstrating and promoting the use of HPC for modeling, simulation, and analysis. I don’t think that title will help them achieve their goals. black art – noun – witchcraft; magic. CFD is not a black art. Yet there it is in the title, in quotes no less. Maybe after 27 years in this business I’ve grown tired of the “CFD is more art than science” argument. Don’t get me wrong – the authors, publishers, and other parties involved in this study don’t have anything against CFD. They are indeed trying to promote it, they seem to have been very productive using it, and the software (CD-adapco‘s STAR-CCM+) seems to have performed admirably. 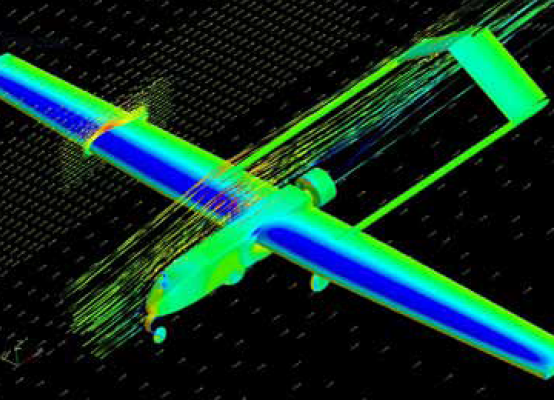 Shadow RQ-7B IE RANS CFD solution from the subject report. Most certainly the case study’s title was chosen partially to elicit a response. And that appears to be working. I heard about it via a tweet from @Symscape, read (OK, skimmed) the paper, and posted this response. CFD is my day job, art is my hobby. Let’s remove art (and definitely the black art) as a speed bump that prevents wider adoption of CFD. This entry was posted in News, Software and tagged art, CD-adapco, CFD, craft, science, STAR-CCM+, Symscape. Bookmark the permalink.